You are not what you eat, you are what you absorb and assimilate, so proper digestion is the key to good health. View below to learn more about the 1, 2, 3 of Digestion. We simply do not eat enough raw and naturally fermented foods these days, so most of us are attempting to break down our food properly with a poor bacteria ratio. 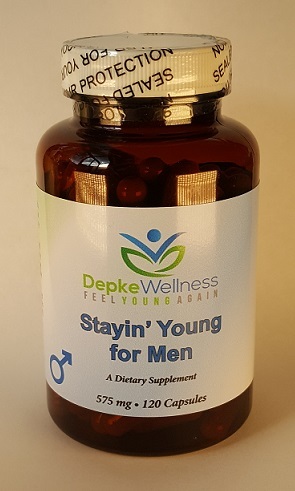 You can address this very easily by taking two Depke Wellness Prebiotic/Probiotic Formula every morning when you wake up. Not only will you enjoy 40 billion good bacteria (the good guys) but you will also enjoy the benefit of the prebiotics to enhance the environment of your gut to properly utilize the probiotic. This is an essential starting point for healthy digestion and proper breakdown of your protein. All natural and raw food contains the enzymes needed to properly predigest this food in the first third of the stomach. The problem is that when we cook our food, we destroy these naturally occurring enzymes, thus decreasing our capacity to properly breakdown our protein. This is where a comprehensive digestive enzyme comes in. The problem with most digestive enzymes on the market today is that they are typically plant based enzymes. Plant based enzymes are great to help you break down plant based proteins but not optimal for breaking down animal proteins. 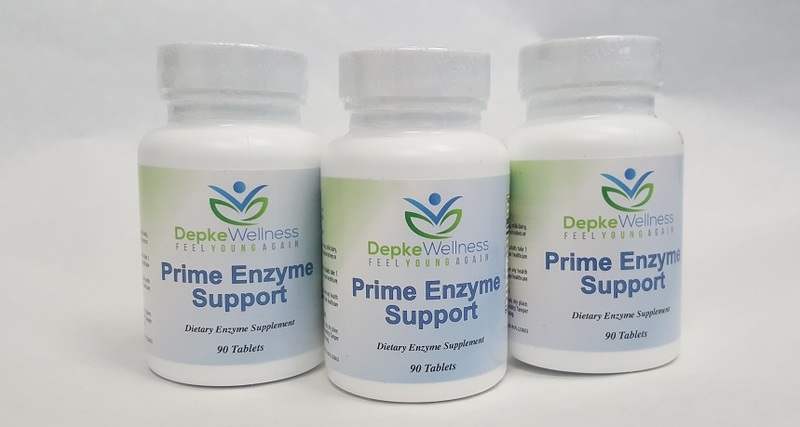 This is the reason why the Depke Wellness Prime Enzyme Support contains both plant and animal based enzymes. After all, we want to break down ALL of our proteins into single amino acids. 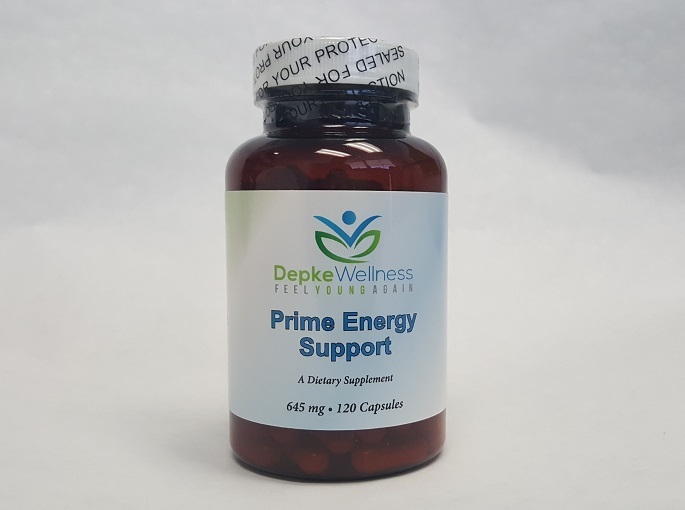 I recommend taking one enzyme at each meal and the best time to take this is after you have taken a bite or two of you food. Stomach acid is ESSENTIAL to properly break down your protein as well as absorbing your minerals and B vitamins. Unfortunately low stomach acid is to an epidemic proportion in our culture. Just look at how many people are are acid blockers or proton pump inhibitors due to acid reflux or GERD. These symptoms almost always coincide with low stomach acid. You do not have to be suffering with GERD or reflux to have low stomach acid though. All you need is a “healthy” dose of stress in your life to leave you deficient in stomach acid. Too much stress, too little stomach acid. 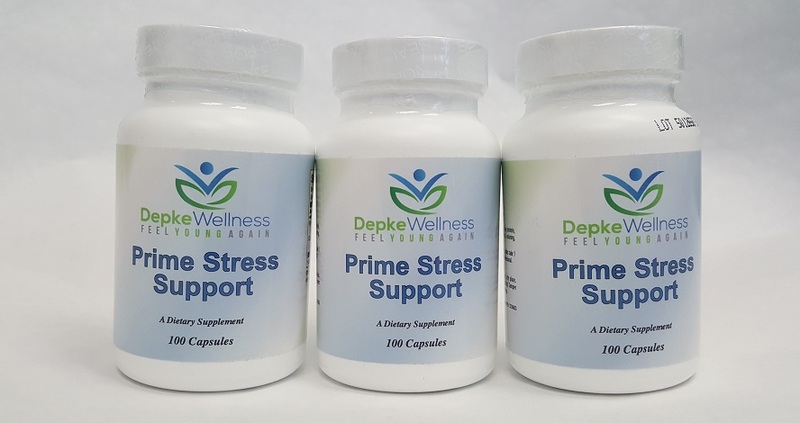 I recommend taking one Depke Wellness Prime Stomach Acid Support toward the end of your meal when you have a bite or two of food left to eat. *If you have stomach ulcers it is best to not use stomach acid supplements. 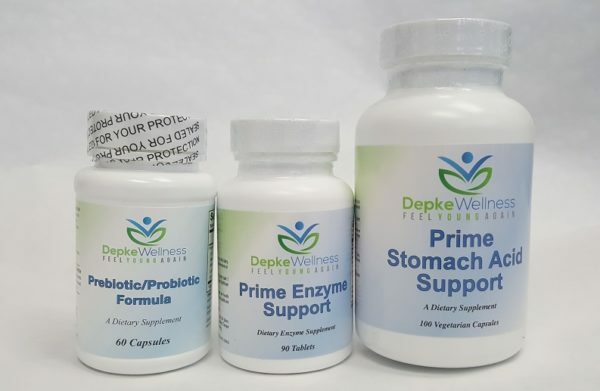 To fully assist the whole of your digestive tract Depke Wellness recommends the 1, 2, 3 of Digestion which would include 2 Prebiotic/Probiotic Formula prior to your breakfast, 1 Prime Enzyme Support with each meal and 1 Prime Stomach Acid Support toward the end of the meal.